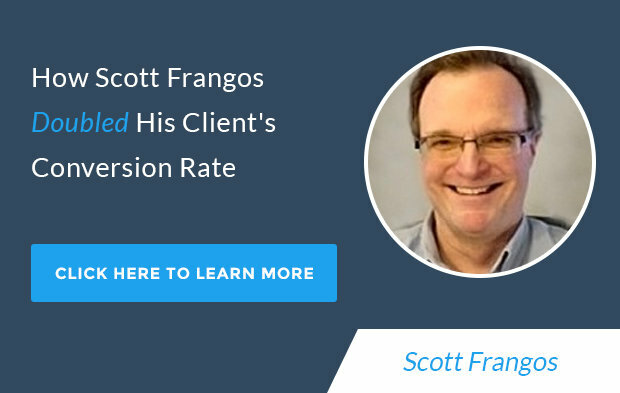 Scott Frangos is the Founder of Webdirexion, a digital marketing agency that he started 4 years ago after a long career in marketing and advertising. The agency focuses on conversions through A/B and other types of testing to help clients improve results. Tim: It can sometimes be difficult for marketers to go back to basics. We want to try the next new shiny tactic that will be fun to share with colleagues and allow us to blaze new trails. But oftentimes, going back to basics can be the thing that results in the best improvement in conversion rate. Such was the case for Scott Frangos and his client Croc’s Casino and Resort. After conducting a relatively simple AB split test, he was able to get Croc’s a 100% boost in email opt-ins all without doing anything you consider revolutionary. I love this episode because it’s a great reminder of how to get a quick effective win. So if you’re an experienced marketer, don’t be put off by its simplicity. Hey Scott, welcome to ConversionCast. Thanks for coming on the show. Scott: Well thanks for having me, Tim. I’m happy to be here. Tim: Absolutely. Happy to have you here. So let’s start it off by talking a little bit about what the results were from the case study we’re going to talk about today. Can you share that with us? Scott: Right. So we have a client that – we have more than one client in the hotel, hospitality space, the one in particular we’re talking about Croc’s Casino Resort, a simple AB test, A page against B page using the Google content experiments. The results were pretty striking. We got 100% lift and we actually ended the test a little earlier than some might have first looked at that and say should you run out longer. But we cut it off at 455 sessions and I can tell you more about that Tim. Tim: Awesome. Okay. So before we go into this specific tactic and how it worked and what you did, tell us a little bit about who you are and what you do. Scott: Alright, thanks. So I founded a digital marketing agency called Web Direction about, gosh I think it’s four years now, before time a long time career in marketing and advertising. We believed very firmly as I know you do in CRO in conversion focus and that’s one of the things we do with AB testing and other types of tests. Tim: Fantastic. Alright so that gives us a good idea as to where this came from. Tell us about the tactic that you used to have such success. Scott: So we had that client and they were actually building a brand new resort from the ground up. When we did the test, the had not even begun building it but they knew they were going to have condos for sale. So we did the first condo interest with a lead form page and looked at it and studied how many leads we were getting and said you know what, let’s do a test and get more leads. So what we did and I think this is sort of the major takeaway from what I’ve learned for people that are maybe newer to doing testing is focus on basics. We would get the headline, the graphic, and the call to action. You used the phrase that I liked a lot on one of your other podcast on Psychology Hacking. We usually think about that in both, well in all of those components I would say but particularly in the call to action. So just to give you a more specific in the headline we used a couple of what I call magic words. In the graphic we look at selling the sizzle and we lucked up there Tim because we could a video in the B page which was a lot stronger than a static graphic in the A page. The call to action, we adjusted a little bit about what we said on the form in the introduction. It kind of structured so that they can get more information and that they knew they might win, they might get a discount on their travel down to the resort. Tim: Can you share with us the page that was more successful, the page that oneness test in a sense? Can you share with us some of the specifics of what were on that and how that compares to the page that wasn’t as successful? Scott: Yeah. Thanks. That’s the great question and it’s a good learning and well this is a really positive result, sometimes we try to test too many things and we don’t get as positive a result. I would want to stress again that the headline we rewrote and when I say magic words, you can actually Google hat and you’ll get different people with opinions of what constitutes a magic word. But they’re words that people pay attention to. So we used the word win right upfront in the very first part of the B page headline and the B page is the one that won. Where before we were saying enjoy the three night stay in Croc’s luxurious condos, here we said win: three night VIP, beachfront package and maybe VIP could be a magic word. There are words that make people sort of stand up and pay attention. In the graphic we actually had a video that they had produced that we could use on the B page. I like to say sort of a basic, back to basic advertising concept. Tim they were sell the sizzle not the steak. Scott: The steak is the façade of the hotel which was in the original graphic. The video showed people having a good time on vacation. They’re in the casino, they’re walking down the beach and doing a lot of other things that you do for the sizzle rather than the steak which was the hotel itself. So that was very strong. And then the call to action we basically added a paragraph above the form that talked up what they were going to win a little bit more in order to entice them to fill out a form. Tim: So what’s interesting to me is it seems like the page that won, the B page ended up having a lot more I guess information on it. There was more – it’s not necessarily that it was more information but there was more to absorb on that page for somebody to make a decision if they wanted to enter. Scott: Yeah. I would say they could interact a little bit more particularly with the video. There were a couple of other minor things that we did and there were bullet points and we just called out certain items in the bullets in a different color thinking those would stand out. As you know and I know you’ve talked with other guests about multivariate testing versus AB we did not do multivariate. It might have been a good candidate when you’re doing more of them but they sort of do that kind of testing. But this was AB. We really wanted it to stand out and it did by I think paying attention to the headline, the graphics which in this case became a video and the call to action. Tim: And those are the main three things you looked at for the most part whenever you want to do any kind of an AB test? Scott: Yeah. Not only that Tim but I often get bushwhacked by [indiscernible [0:07:36]] enthusiasm of trying something else and getting too tricky or too complicated. I often I guess I would – what I would say to your listeners is focus on these three main basics, the headline, the graphic, the call to action and you’ll do fine especially on a simpler AB test. Then if you have the traffic in the longer time period for multivariate then you can start looking at some other things. Tim: I love it Scott. Well I think this is plenty for people that you want. So thanks so much for bringing this case study to us. I appreciate you sharing it on the show and thanks for being here. Scott: Thanks very much for having me, Tim.